After my post last week on the apparent Australian concern that somehow New Zealand was providing a back door entry to Australia, for migrants who could not get into Australia directly, a commenter included a link to the text of a fascinating National Library lecture (itself drawn from a journal article) by Victoria University researcher Paul Hamer. That made it clear both how longstanding these concerns have been – going back 100 years or so – and how focused they are on Pacific Island immigration to New Zealand. Some of it looks like out-and-out racial biases. But these days it is a bit different. In their report on New Zealand out today, the IMF described our immigration policy as “fully merit-based”. In fact, while that is more or less, and mostly, true, it isn’t fully so. Within the annual target (“planning range”) of around 45,000 residence approvals, we have Pacific quotas, for Samoa and for a group of other fairly small Pacific countries. People from those countries can get in, to a certain extent, even though they do not have the skills, qualifications or whatever to get in through the standard nationality-blind policy. In the year to March 2017, just over 1,600 people were granted residence under these quotas. In time, presumably, most will become New Zealand citizens. They, like other New Zealand citizens, would then be free to move to Australia if they chose. Australia, I gather, has no such nationality-specific immigration quotas. In the past Australia’s concerns apparently extended to people from the Cook Island and Niue. They are New Zealand citizens as of right, and don’t have to move here to be able to move to Australia. What do the data show about this? We do have Permanent Long Term (PLT) data on the departures of New Zealand citizens to Australia, broken down by birth country. In my post the other day I just looked at the aggregate of the non-NZ (and non-Australian) born. But one can dig deeper, using data that cover each year back to 2002. Taking the Cook Islands born people first (since they aren’t covered by our immigration policy), there were total PLT departures to Australia from New Zealand of 3,776 such people in the 16 years for which we have data. That isn’t perhaps large by Australian population standards, but it is equivalent to quite a large chunk of the small Cooks-born population. Presumably, some other Cooks-born people might have gone directly to Australia (if there are direct flights). The Cooks-born population of New Zealand in the 2013 Census was just under 13,000. However, a lot of those Cooks-born people came back again. Over the same 16 years, the net outflow to Australia of Cooks-born people was a relatively modest 1,248. 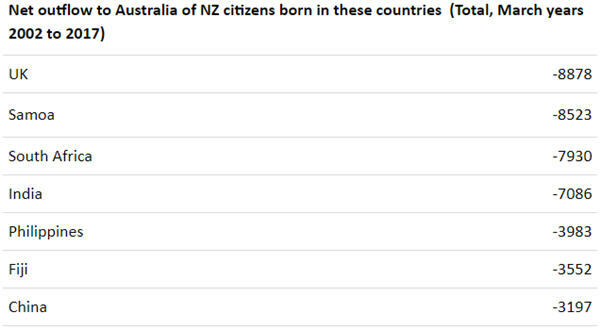 What about NZ citizens born in other countries, who mostly gain entry only through our immigration policy? Net outflow to Australia of NZ citizens born in these countries (Total, March years 2002 to 2017). The UK tops the list. Then again, there are many more British-born people in New Zealand than there are people born in any other country (about 256,000 at the 2013 Census). 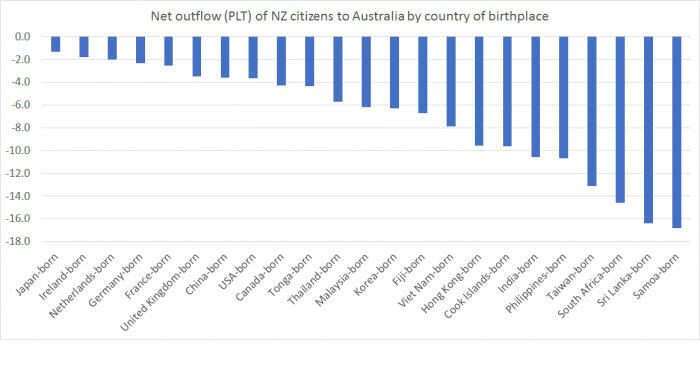 So here are the net outflows over the sixteen March years (2002 to 2017) to Australia of foreign-born New Zealand citizens, as a percentage of the 2013 NZ resident population of people born in that country. If the Australian government really is concerned about those Pacific Island inflows, the Samoa figures might appear to give them some support. Then again, the South African and Sri Lankan born outflows, as a share of the respective populations, are almost as large – and presumably those people got into New Zealand by meeting our nationality-blind tests. For some of those birthplaces, the proportions seem quite remarkably high. As it happens, the Cook Islands numbers are quite a way down the list, and Tonga further still. SNZ don’t publish the data at a sufficiently disaggregated level to know what the proportions look like for New Zealand citizens born in Niue, Tokelau or Kiribati. I don’t have any great or specific interest in this apparent concern of Australia’s – and frankly the absolute numbers seem pretty small relative to the size of Australia’s population (and overall migration inflows). But, the subject having come up again, I was interested in what light the published data could shed on the issue. Michael Reddell has spent 30+ years doing economic analysis and policy advice in a range of institutions, in New Zealand and overseas. Most of that time was at the Reserve Bank, including a spell as Head of Financial Markets, responsible for monetary policy implementation, foreign reserves management, and the analysis of financial system risks. He spent 25+ years on the (equivalent of the) OCR Advisory Group to the Governor, and many years on the Bank’s key internal financial regulation policy committee. [Read the Croaking Cassandra article].